Most animals sleep, but why they sleep and how the brain generates sleep is mysterious. 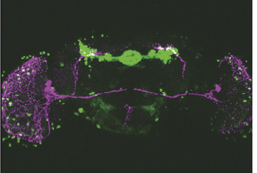 In a recent study published in Neuron, postdoc Katherine Parisky and colleagues use genetic tools to manipulate the activity of neurons that control sleep in flies. Their results demonstrate that in the fly sleep is generated by GABAergic inhibition of a small cluster of peptidergic neurons within the circadian clock. Flies carrying mutations in this peptide, PDF, or its receptor, are hypersomnolent, similar to human narcoleptics who have defective signaling by the peptide hypocretin/orexin. These results suggest that the circuit architecture used to control arousal is ancient.